Finished Aug 2018. Final score: 3 / 5. 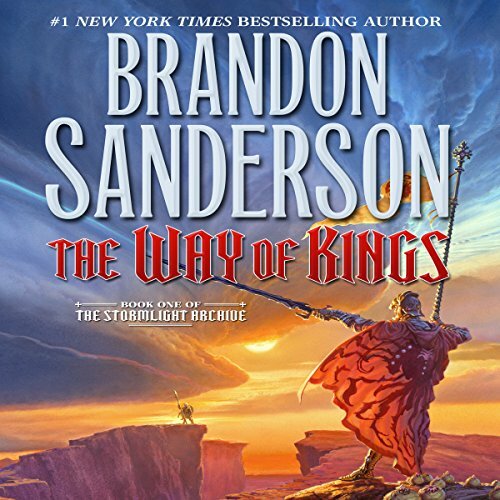 I'm a fan of Brandon Sanderson. None, other than I heard it has a non-ending. If you want 3 good intro fantasy novels combined and stretched to 1000 pages, then here you go. This is an epic book, both in fantasy mechanics and size. On one hand, it is hard to get too upset. We are given a diverse set of characters thrown in to interesting situations. On the other hand, after 1000 pages, nothing particularly remarkable happened. Everything was just a lead up to book 2. It reminded me of watching a popular sci-fi series going in to extended seasons. The main goal is... "Don't want to upset the balance too much with anything groundbreaking. We want to milk this show as much as possible"
At the end of the book, it does throw us a bone. A couple of important revelations in each story arc is made. Those tidbits sure required a lot of reading to get there. Kaladin is a dark-eyed slave. Why is he skilled in such noble arts like fighting, surgery, and leadership? These are explained through endless flashbacks. Dalinar is a high prince, second only to the king. Above all things, he values honor. He is an exceptionally skilled warrior and abhors needless killing. Despite being a fairly predictable caricature, his stories were enjoyable. Shallan is a noble woman of minor stature. She heads off to a far away city to become the ward for a renowned scholar who happens to also be the king's sister. Shallan's goal is studying plus a bit of subterfuge. During her time with Her Majesty, she starts to respect the princess's odd beliefs. What ultimately happens is very predictable, though the book does manage to drop a few curve balls along the way. There were various interludes throughout the book involving Szeth, an incredibly dangerous assassin with odd loyalties. Some side notes: The whole "safe hand" / "free hand" for women was never explained. It seems to be just a quirk in their culture: A women's left hand should not be exposed. Also, the reason light-eyed people are higher rank than dark-eyed people is not explained either. An interesting character named Wit remarked (paraphrasing), "Is this method of selecting leaders any nonsensical than others out there?" This book is needlessly long. If this book was given to me, I'd completely drop the Shallan story -she did not seem to serve much purpose- and reduce the Szeth interludes. That'd save a few hundred pages and give the overall book more focus. I'd also cut a few backstory chapters from Kaladin. Yes, his failure to protect his brother is an important part of his development. However, do we need additional backstories showing that he cares for his brother? Can we just assume he loved his brother since he is upset about the loss? Also, is the tension between Kaladin's father and the minor town aristocracy worth the chapters given to it? Cut all those. Anyway, there is a truly excellent, focused, fantasy story buried somewhere in this 1000 page tome. The content that was present is good. The editor in charge just needed to trade his rubber stamp for a scalpel. For that, I deducted 1 point. The other lost point is the total lack of an ending. It ended with Book 2 feeling like required reading instead of an invitation to continue the story. I do plan to resume the story. If you are willing to commit to the whole very long series, this was a great fantasy story. Consider yourself warned that book 2 is not optional. Discuss The Way of Kings (Book 1) in the forums.